The Volume Purchase Programme allows educational institutions to purchase apps and books in volume and distribute them to students, teachers, administrators, and other employees. * The programme also allows app developers to offer special pricing for purchases of 20 apps or more. Redeemable Codes: Download a spreadsheet containing redeemable codes which you can then provide to your users. Ownership of the app or book is given to the Apple ID that redeems the code. Codes will only be redeemable in the UK store. Managed Distribution: Assign apps to users or devices using a Mobile Device Management (MDM) solution, such as the latest version of Apple Profile Manager. You retain ownership of apps which allows you to revoke and reassign them as needed. Review Order Books cannot be revoked after they are assigned. To assign apps or books to users, they must be on devices with iOS 7 or later installed, or OS X 10.9 or later installed. To assign apps to devices, devices must have iOS 9 or later, or OS X 10.11 or later installed. You will be notified by email once your order has been processed. You will also receive an email receipt showing any applicable taxes. You can check on the status of your order at any time in Purchase History on your Account Information page. You will be notified by email once your order has been processed. You can check the status of your order at any time in your Purchase History. Place Order Cancel Books cannot be revoked after they are assigned. 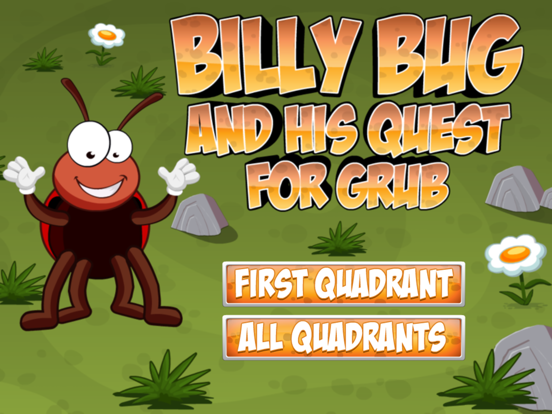 Billy Bug and his Quest for Grub is designed to help children learn how to use coordinates in a fun and engaging way. Make short swipes on the screen to move Billy to the given coordinates. Billy is a greedy little bug and will need to be fed ten times! How quickly can you feed Billy? 1. Coordinates in one quadrant. 2. Coordinates in all quadrants. Beginning of a good idea and nice graphics. 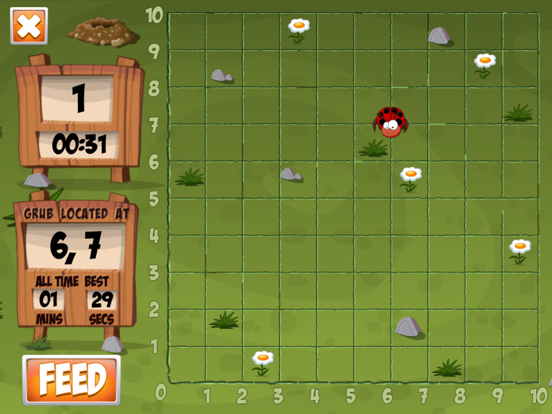 It looked as though it would be a sweet, simple game to play, but it might play better if the movement was smooth scrolling, rather than one co-ordinate at a time and if the bug’s phrases could change occasionally. It also takes up more storage space than I’d expect for what it is. Overall, I felt it had lots of potential, but it’s not enjoyable to play at the moment. You could also add something to help with someone getting lots of wrong answers, by adding a demo button to move the bug along and highlight the co-ordinates as it reaches them? Compatibility: Requires iOS 8.0 or later. Compatible with iPhone, iPad and iPod touch. This application has not received enough ratings to display a summary. *Subject to Apple Volume Purchase Programme terms and conditions. Any primary or secondary education institution or any accredited, degree-granting higher education institution in the United Kingdom is eligible to participate. Note: Apple reserves the right to determine eligibility. Campus bookstores and other retail institutions are not eligible. Volume Purchase Programme credits cannot be resold.